Lake Minnetonka Association: Three Bay Milfoil Treatment - What Next? With the summer season nearly over, we have had a chance to evaluate the results of the Three Bay milfoil treatments (Carmans, Grays and Phelps), take what we have learned and consider continued treatments in 2009. While the treatments did not have the results we expected, there were positive results. Recall the objectives of these treatments were to control milfoil, preemptively control curlyleaf pondweed (another exotic plant), protect and restore native plants and minimize lakeshore clean up of milfoil fragments that wash ashore. However, the objective at the forefront of most people’s minds is to control milfoil. The results varied. The results on Grays Bay were the best. Milfoil did not form mats and the bay was open for water recreation all summer. In fact, I even saw people swimming by the highway 101 causeway this summer. – something that had been impossible in past years Milfoil has grown back late in the season. Carmans Bay results were the poorest, as there was little milfoil control throughout the bay. However, except for a few areas, milfoil did not mat in Carmans Bay and residents reported higher recreational activities compared to past years. Phelps Bay results were mixed – good milfoil control on the north end of the bay and poor control near Enchanted Island. However, the applicator and manufacturer of the herbicide provided warranty treatments in nine acres (at no cost to the project) and this provided good control in those areas. Curlyleaf pondweed has not become a problem, we have no evidence of damage to native plants and we have had residents report greatly diminished shoreline cleanup chores this season. 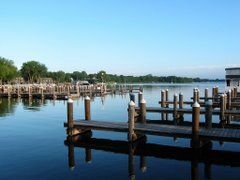 The Lake Minnetonka Association invited manufacturer’s representatives to help the technical committee evaluate the results and assist in recommending modifications to the treatment approaches in 2009. We have learned there was significant dilution of the liquid product in 2008, which led to inadequate contact time of the herbicide and therefore less milfoil control than expected. Based on similar treatments in other lakes, this was not expected. The manufacture and applicators will be working with the technical committee to adjust the treatment protocol and they have agreed to provide assurances the modified protocols will provide long-term milfoil control as well as meet the other program objectives. The Lake Minnetonka Association and the project team has learned a lot during this first year and we believe the refinements that will be proposed for 2009 will be significantly more effective. The Lake Minnetonka Association remains unwavering in our view that using selective herbicides will ultimately be the most effective tool for lake-wide milfoil control and an important element in our Milfoil-Free Minnetonka vision. Representatives from the Three Bays are now working with the Lake Minnetonka Association in fundraising efforts to support the 2009 treatments. In related developments, we have recommended these treatments be expanded to other bays. Because this year’s results were not what we expected, the technical committee has recommended that expansions beyond the Three Bays not occur in 2009. The Lake Minnetonka Association agrees this is the proper approach. We have had interest in future expansions from representatives of several other bays, including Gideons, St. Albans, Libbs Lake and Carsons Bays, and we will continue to work with these bays. The Lake Minnetonka Association also sponsored a forum of other Minnesota lake associations who are dealing with milfoil management. These associations are experiencing similar challenges and frustrations as Lake Minnetonka and we had a productive meeting. I am gratified the Lake Minnetonka Association and our members support our leadership in the area of milfoil control and we are looking forward to continued progress in 2009 and beyond.